The castle of Digoine, "an impregnable fortress, a stronghold built from blue stone, and referred to as Petit Digoine" according to a document found in the monastery of St Symphorien d´Autun, was built around 1233 by the then lord of the manor, Seigneur Thibaut. His successors were to become a thorn in the flesh of Charles de Montago, Duke of Burgundy. From their fortress they were able to ward off his attacks, and although he controlled the nearby village of Couches, he was never able to take Digoine. The castle passed into the possession of Seigneur Guillaume de Damas in about 1400. 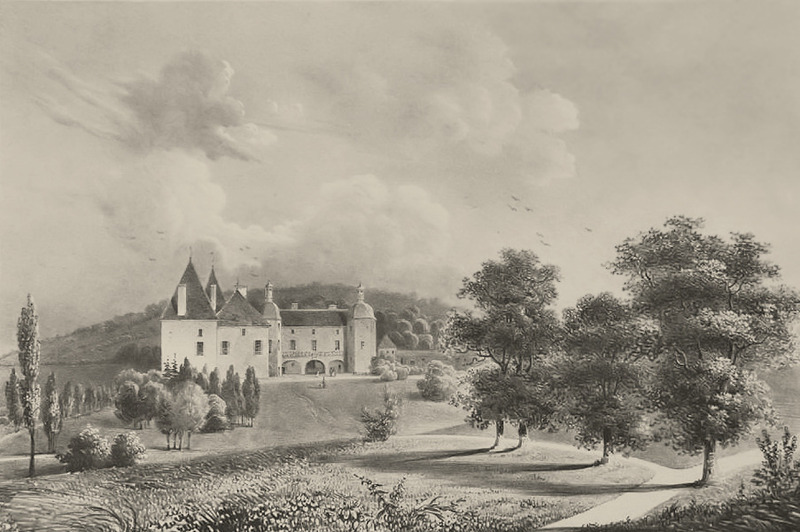 The Damas family, who owned the large Chateau de Digoine at Palingen in Southern Burgundy, were not interested in living in its smaller namesake. By 1446, Petit Digoine, by then not much more than a ruin, was sold for 1200 sous (the currency of the day) to clear the family´s debts. Its new owner was a nobleman by the name of Oudot van Malain. During the 16th and 17th centuries the castle was to change hands many more times, and little is recorded. It is known that it was enlarged, with the addition of two towers and a stairway during the 17th century, and that the house was bought by the Falletan family around 1730. The Falletans rebuilt the south side of the castle and fitted large windows in the whole building. It was Henriette Falletan who, in 1806, sold the still much neglected Chateau Digoine to Monsieur Francois Louis, Comte de Musy. Comte de Musy was responsible for the building of a new wing, with two round towers, and the installation of the present stairway. He also had the buildings surrounding the courtyard erected - two identical houses -, the orangerie, a lodge for the hunting dogs, and a tea house. The Comte was a passionate hunter, and a generous giver of large banquets. It is the latter that are rumoured to have ruined him. In 1883 he bequeathed the castle, and the huge debts he had run up, to his godson, the Comte Charles de Prunelé. Comtesse de Prunelé, fortunately for her husband, was reputed to be the second wealthiest lady in France. Comte de Prunelé, meanwhile, was able to clear his inherited debts by the sale of an enormous amount of the comtesse´s gold. Four nieces and nephews inherited the estate of the widowed Comtesse de Prunelé on her death, among them Comte Christian d´Avian de Ternay, whose family have owned Chateau Rully since the 13th century. Petit Digoine has not been lived in since 1930, although it was briefly occupied by an order of monks during World War II. In 2003 Comte de Ternay sold Chateau Digoine and the adjacent farm. 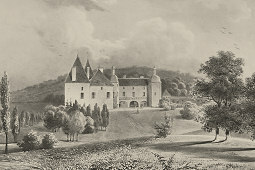 Thus, the castle became the property of its present owners. The surrounding woods and fields are still owned by the de Ternay family. The farm was bought by its tenant. Château Digoine is now in need of total renovation. Most of the interior dates back to the time of Comte de Musy. The last major changes were made in 1854, and included a main stairwell, a small library with curved bookcases, lovely stained glass windows, a chapel with lifesize statues, wood floors, marble mantelpieces and ornate ceilings. In the kitchen there is a mantelpiece dating back to 1359, one of the last reminders of Seigneur Thibault´s "impregnable fortress".